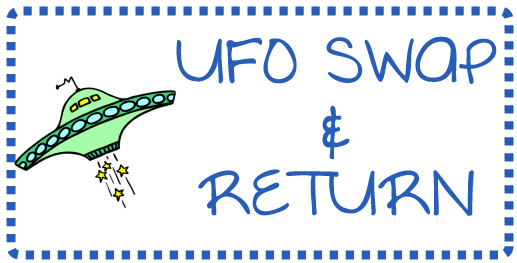 So, here are some details to consider if you want to participate in this fun UFO SWAP /Community Service project. • This is more like a UFO SWAP & GIVE instead of return since the finished project made from your UFO will be donated to Pleasant Place. • Projects created from the UFOs should be quilts. They can be tied, hand quilted or machine quilted and bound. • You will have 2 months to finish the quilt using the UFO you go home with this week. Finished quilts will be due on Wednesday, September 4, 2013 at our monthly meeting. • Minimum quilt size is 35″ x 35″. •We are doing this as a part of Swim, Bike, Quilt’s annual 100 Quilts for Kids charity quilt drive! I’ll be uploading pictures of our finished quilts and linking them to the linky party at the end of September. Thanks for participating and bring your UFOs to Wednesday’s meeting! Thanks again for participating in 100 Quilts, and it sounds like you guys picked a great group to donate to.